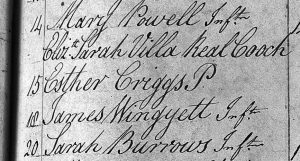 Elizabeth Gooch was born in Edwinstowe in 1756, but her maiden name was Elizabeth Sarah Villa Real. 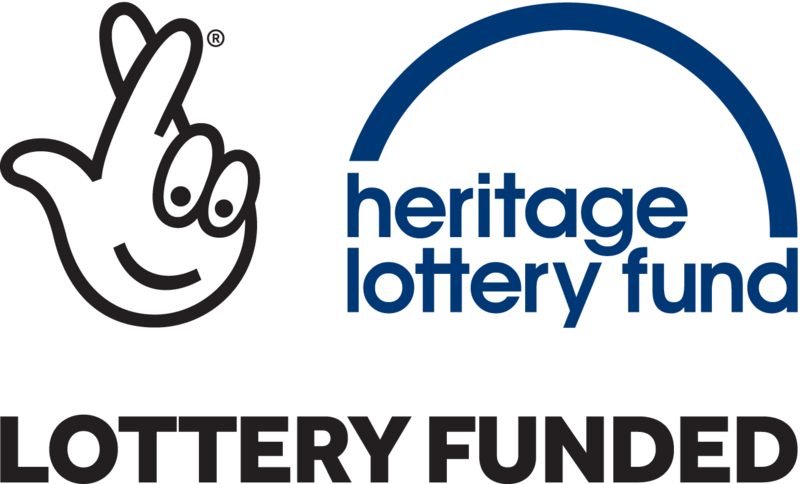 She was the daughter of William and Elizabeth Villa Real, and lived with her parents in “Villa Real Farm” which is situated on the main Mansfield Road in Edwinstowe. Sadly, her father died when she was 3 years old, leaving her sole heiress to the estate in Edwinstowe. Her mother and Lord Galway (husband of her father’s sister) were her joint guardians. Her mother remarried but sadly was widowed again four years later. A few years were spent at boarding school and then she returned to live in Ripon with her mother. There she became attracted to a young physician (Dr. Crawford) and they planned to elope, but her mother put a stop to it. 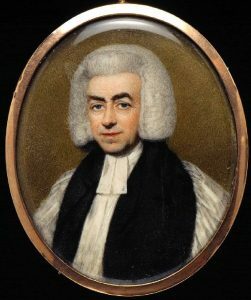 Being a niece to a Vicountess, a bishop and the Prince of Wales’ physician, she was well connected in society, and in 1775 mother and daughter took up residence in Bath. 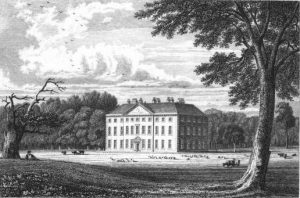 Arriving there, people were aware of her wealth which in turn brought forth a number of interested gentlemen, one of whom was William Gooch, 2nd son of Sir Thomas Gooch, Bt. of Benacre Park. The marriage took place that same year. Not enjoying life in London, the Goochs returned to Yorkshire where Elizabeth gave birth to 2 sons. (Thomas William and Henry Robert). Whilst Mr Gooch had suspicions that Elizabeth was too fond of Lord Banff, one of the officers from the Inniskilling regiment, he himself was having an affair with a widow, Mrs Hudson. Another move took them to Bath, where Elizabeth had music lessons with Venanzio Rauzzini, but a note written by him to Elizabeth was found by Mr Gooch who wrote to her mother, and acquaintances, informing them of the affair, and the family threatened her with a scandal unless she left Bath, suggesting she go into a convent in France. Arriving in Lille on New Year’s Day 1779(? 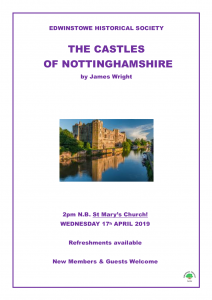 ), Mr. Gooch booked a lodging and hired 2 servants, and said when the affair had blown over they could return to England and live in Edwinstowe. In the meantime, he returned to England to put things in order. Elizabeth found she was not welcome amongst the English women in the town and began a series of dubious relationships. One, an English officer called Semple, and a Mr. H….. who appeared anxious she should marry M. DuBuq if a divorce from Mr. Gooch could be obtained. She did apply for one but only succeeded in being granted a partial divorce, and not a full divorce which would permit the couple to remarry. Also, she had signed away her inheritance and could expect only £200 per year. Having covered M. DuBuq’s debts, and with no sign of a divorce the relationship ended. She then became acquainted with Baron Arthaud an officer of the Cuirassiers. At this time the Baron had absence of leave to visit his mother with whom Sarah decided to stay, but soon realised they were interested in her inheritance, with gaming sessions taking place during the evenings when officers of the regiment Dauphin based in Toul were entertained. Elizabeth decided to leave the Baroness’s house and travel to Calais with the Baron, but the Baroness kept her trunks to defray the expense of her living at her house. After the Baron returned to his regiment, Elizabeth remained in the convent until she left for England to stay with her Uncle for a while, before she heard again from the Baron imploring her to return to France. Her uncle said he would supply her with anything she wanted in England, but nothing towards her return to France. However, she returned to Calais and for a while alternated between living in France and England, once again becoming involved with several gentlemen. Sometimes living in style and others moving to poorer accommodation. On one occasion while living in London she ran into debt and ended in the debtors’ prison but was bailed by a friend. Often, she would pledge gifts of jewellery she had received. Afraid of being arrested if she remained in London, she was introduced to Mr Thornton, the manager of the Portsmouth company which was then at Farnham in Surrey. Mr Ryan who observed her performance persuaded her to join Austin and Whitlock’s company at Chester, where she assumed the name of Mrs. Jackson. But after a while Elizabeth became disgusted with the stage and returned to London, before sailing to France. Here she rented a small house in Dunkirk where she met M de Guichen, First Lieutenant of the Ceres then lying at anchor in Dunkirk harbour. The ship would be based in Dunkirk for six months and Elizabeth decided to pass the summer there. One morning she heard that the Ceres was due to anchor and went to the pier, but the seas were rough and the boat bringing the men ashore sank taking the lives of Viscount de Roquefeuil, M. de Guichen and three sailors. The deplorable event took place on 24th August 1785 after which Elizabeth left Dunkirk and travelled to Lille, where the shock of recent events caused her to become ill.
Again her debts caught up with her and she was arrested by all her creditors and conducted to the prison, where conditions were horrific. Her cell was locked up every afternoon at five, and the door was not opened till ten the next day. She wrote to her family and friends without success, apart from one letter received from a gentleman related by marriage to the family. He chastised her for having squandered away her money and having run up a bill of forty pounds at a tavern. However, directions had been given to a banker to pay her two guineas a week for subsistence. One morning she was asked by a visitor, M. Grandel, who was visiting his nephew, M. Parquet, the reason for her imprisonment, and after hearing about her debt he assured her that she would have the money that afternoon to settle her debt and have sufficient money to return to England. She agreed for the nephew to stay with her in England to enable him to follow his profession of surgery, and that the money advanced might be returned to M Parquet. Arriving in London Elizabeth rented part of a house where she looked after M. Parquet for more than two months, providing him with money and paying for clothing to enable him to take up a situation, assuming that this would cancel M. Grandel’s debt. The nephew caused her a great deal of worry so she decided to give him a sum of money to help him on his way. Elizabeth enjoyed the company of the Duc de Lauzun, and the Marquis of Queensbury and, once again, her debts mounted, which meant she had to move. But it was not long before a Frenchwoman walked into her room accompanied by two bailiffs who arrested her for fifty pounds, and she was conducted to the Marshalsea prison, and then the Fleet. Apparently, M. Parquet was living with the Frenchwoman, and the note on which she was arrested was the one given to M. Grandel at Lille and had been endorsed over to her. However, friends rallied round and sent gifts and money. “To those who remember who Mrs. Gooch once was – her present state in the Fleet Prison, must afford a strong lesson, of the superior guidance of Virtue through life. “The above Lady, when Miss Villa-Real in Yorkshire, on her marriage with the son of Sir THOMAS GOOCH, brought to him a fortune of thirty thousand pounds. But so early was the romantic spirit implanted in her bosom – that previous to that time, she was on the brink of running off with five or six different Gentlemen – and who may truly be said to have – narrowly escaped the noose! The Bishop of St. Asaph, her uncle, paid the rent of a better room for her in the Fleet, until her affairs were settled, and she was released. When this took place, Elizabeth went to a lodging in Featherstone Buildings that her mother had arranged. 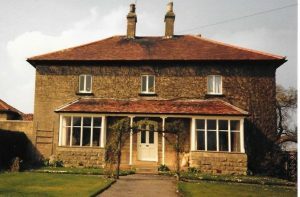 After staying there for five weeks, the Bishop and her mother suggested that she took residence under an assumed name with a family in the country, and that she should renounce every former acquaintance and contact with any person whatever, also that she should be wholly guided by the Bishop in every respect. As regards the payment of the remainder of her debts she should make a payment of forty pounds a year until the whole was paid. Only in those circumstances would her mother consider calling to see her, and unless she accepted the terms she must not expect to have any further recognition from her family. Her pride forbade her to accede to these proposals, and much as she longed to see her mother she declared that she would not make any promise that she could not keep. She left Featherstone Buildings, objecting to the manner in which she was watched. Having taken a lodging in the city, once again she was arrested for debt. One evening when spending time with her neighbours in the room opposite her own, a chance acquaintance of theirs (Mr Kennebel) joined the group. He expressed concern at Elizabeth’s situation and next day released her. He paid off her debts and costs, so Elizabeth made over to him a power of attorney to receive the half of every quarter’s annuity until the whole was paid. Her next lodgings were in Ovendon Street, where she became involved with Captain Lindsey of the fifty-fifth regiment who originated from Antigua where his family owned a plantation and estate. While in Barnet he received orders to go to Nottingham and Elizabeth returned to London to settle some business. Within 2 days she heard that she was going to be arrested, which forced her to pack up and set out to join Mr Lindsey in Nottingham, where she went by his name. They remained there between two and three months during which time they visited Mansfield and Edwinstowe where she visited her father’s grave. Then Mr. Lindsey received a letter from his commanding officer, with orders to join the regiment at Glasgow. Previous to departure Mr Lindsey had sent his servant to Chesterfield on regimental business. It occurred to Elizabeth that a natural daughter of her father’s had been married, some years before Elizabeth had been, to a person then living there of the name of Dutton, Mayor of Chesterfield. The sergeant took a letter from Elizabeth to Mrs Dutton who replied to suggest a meeting, for they had not seen or heard from each other for fourteen years. When her father died, her sister was a few years older than Elizabeth and, although he had adopted her, she was not mentioned in the will. When Elizabeth’s mother left Edwinstowe she was bound apprentice to a mantua-maker in Mansfield and then left to provide for herself. They left Chesterfield on 16th January, 1789 reaching Glasgow on the 23rd, where fresh orders arrived to head a party going to Beith where they stayed for two months. 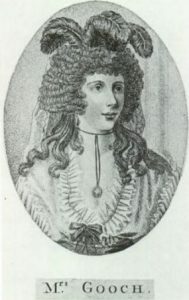 After the expiration of their time they returned to Glasgow, then prepared to return to England, visiting many residences en route, before stopping in Chesterfield to see her half-sister. There they remained for two months, being present at the baptism of Elizabeth’s niece, Mary. Mr. Lindsey then received advice of a ship coming from the West Indies to Bristol in which he had a considerable sum of money in sugars, etc. Being charmed by the beautiful countryside Elizabeth encouraged Lindsey to take a house there, and refused to return with him to Scotland. A decision she regretted, as she continued to live there for almost a year, after which it was her intention to go to Edinburgh. However, as she was on the point of leaving, a letter arrived from Mr. Lindsey saying the regiment was to go to Portsmouth, prior to embarking for foreign service. After that it went to Ireland, and Mr Lindsey went to see his family in the West Indies. Elizabeth never saw him again, but he did provide some financial assistance. In the meantime she went into Wales and passed the winter at Scarborough, although the Morning Post reported another alliance for her and placed her in Ireland. The stage once more beckoned, with a licence to act at the Haymarket Theatre in London being granted and, as Mrs. Gooch, she appeared on that stage in February 1796 as Almeria in The Mourning Bride and Lady Minikin in Bon Ton. 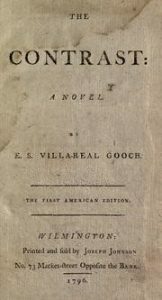 Following her “Appeal” she wrote “The Life of Mrs Gooch”, followed by other publications, novels and collections of poems. 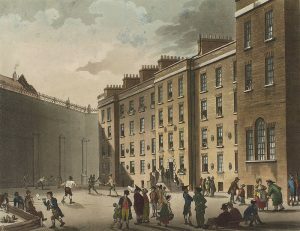 1802, Elizabeth was living at 20 St. Michael’s Place in Brompton, still beset by debts and appealing for assistance: “A CARD – To the Public. Elizabeth died in Plymouth, Devon, in 1807. Her eldest son, William, died in 1806, and her youngest son Henry died in 1829. 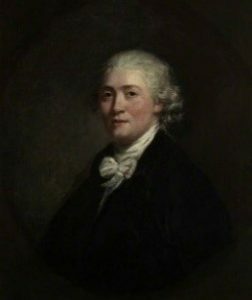 William Gooch died in 1833. Her mother died in 1797. Source: The Life of Mrs. Gooch. Written by herself. Dedicated to the public.